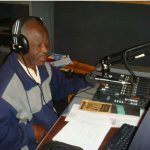 Breeze FM Radio Station Founder/Director, Mike Daka has been awarded the ‘2012 Lucy Sichone/Bright Mwape Award’ by the Press Freedom Committee of The Post newspaper. The award is presented once every two years to deserving individuals for their accomplishment of outstanding service to the cause of media freedom and freedom of expression and other human rights. Mr Daka is the sixth recipient of the award.